Home / Insurance / Life Insurance Exam Blues? Other than deciding which type of life insurance to buy, how much coverage they need, and life insurance costs one of the other things people tend to worry about is the life insurance exam. None of us like tests and most people don’t like going to the doctor so when you combine the two you give lots of people a reason to avoid applying for a life insurance policy. They know that after they choose between life insurance quotes, pick the right amount of coverage, and fill out their application that they’ll have to face the dreaded exam to get approved. To help calm those fears a little I’ll walk you through my recent life insurance exam and what all it entailed. For years I’ve had life insurance coverage through my employer, but after we had our third kid I decided it was finally time to buy a separate term life insurance policy. After submitting my application the next step was a medical history follow up. The insurance company didn’t do that follow up themselves – they use a third party service that called me up a few days after I had applied. I spent about a half an hour on the phone answering all kinds of medical questions, some of which I wasn’t ready for. The questions made sense it’s just that I didn’t really have all the information in front of me. For example they wanted to know the date of my last physical exam, if you’re a relatively heathly person, who can remember in detail the last time you went to the doctor for a checkup? If you’re also applying for a policy for a spouse or your kids, they’ll want to know the dates of their last checkups as well. The lady on the phone also wanted the address and phone number of my doctor, which I didn’t have handy either. I did know my physicians name so they were able to look up her information for me. At the end of the approximately 30 minute conversation they said someone would be contacting me to set up an actual physical exam. After another few days I did get a phone call to set up a physical exam. I explained that with a job and three little kids I was pretty busy and didn’t have a lot of free time to be making doctor checkup appointments. So they were actually able to schedule it on a Saturday and had someone come out to my house and do the physical here – definitely very convenient. The physical exam itself was not very involved. It basically consisted of a lady weighing me, measuring my waist, taking blood and urine samples, and asking me a few more questions. She was gone about half an hour after she showed up at our door. So the exam itself was no big deal. If you’re wanting to lose weight, the exam can be a good motivator. You know that you can probably get a better life insurance rate if you weigh less so you’re motivated to lose weight for two reasons, to get healthy and to save money. Ideally you’ll lose that weight before starting the life insurance application process because during the phone interview, one of the questions they ask is how much you weigh. However, by the time you hear back to schedule your physial exam and pick a date that works for you, you might have 2–3 weeks after the phone conversation before your exam. So if you schedule strategically you could have several weeks time to hit the gym, eat uber-healthly, and shed the pounds. You’re basically losing weight for a weigh-in, kind of like your wrestler friends did in high school. Someone’s going to show up at your house and put you on a scale and you had better weigh the amount you said on the phone. I’m not suggesting that you should lie on your phone interview because they base their rate quote on the information you give them over the phone. But who knows exactly how much they weigh right? If you’re accidentally 10 pounds off with your answer you’ll probably be super motivated to lose that weight before they show up. So overall, the exam itself is no big deal. Just be aware that they’re going to ask you a lot of questions on the phone and for the sake of saving money on life insurance (and your health) you want to be able to give the “right” answer. There are some answers you have no control over. Like, “Did either of your parents die before the age of 60”? But, like your weight, there are definitely things that you can anticipate and make changes for. Do you smoke? Do you drink alcohol? 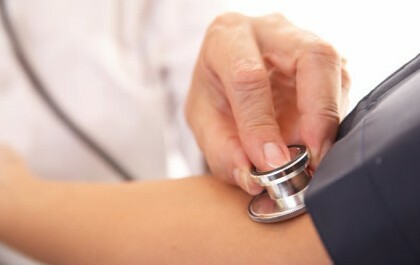 Do you have high blood pressure? The physical exam and lab work they do will verify some of your answers. They’ll probably also require your permission to contact your doctor and look at your medical records. If you’re not truthful, they’ll probably figure it out. So just try and plan ahead and adjust your habits so you’ll be able to give answers that will cost you less money. This post is part of the Life Insurance movement, out to educate consumers about the ins and outs of life insurance. 6 Responses to Life Insurance Exam Blues? That’s good to know about life insurance. I’ve been meaning to lose weight for some time and now I have even more motivation. I hope it leads to results this time! Learning about the questions, I doubt that they will like me. Anyway, great advice on keeping myself fit and living healthy in order to increase chances of getting the insurance. I had the exam done, and really I’m not a fan of needles, so it made me nervous. But was it worth it? Totally. Now my wife is protected if she loses me and my income. My husband and I have had life insurance for over 25 years and I can’t remember having to have a physical. Is this something new? I suppose the policies were different 25 years ago. You can get no physical life insurance but if you are applying for more than a certain amount of coverage you’ll probably be required to get a checkup.